There are multiple types of grass. Of course, there are the bluegrass or fescue varieties that are traditionally used for lawns. There are a variety of native varieties as well, which include the sedges. There are over 100 species of sedge. They are easy to grow and practically maintenance free. Wholesale Nursery Company sells a variety of sedges: the Fox Sedge, Twisted sedge, and Blue sedge are some of the types we have available. More exotic grasses include the Branched Muhly, which produces striking pink and purple blooms in the fall. Low maintenance, it is excellent for meadow gardens or a garden specimen. Wool Grass is a large, upright marsh variety with an attractive wooly flower head that turns coppery in late summer, and stays through the fall – and maybe winter. Beautiful, sustainable, and authentically American, there are many great reasons to incorporate native grasses into your landscaping design. Native grasses are indigenous to the American Plains states, which means that they are tough, resilient, and adaptable. If you're looking for deep-rooted, low-maintenance native grasses that will add character to your yard, here are top options. Hachita is a blue-toned grass that does best in USDA hardiness zones 5-9. Hachita produces narrow leaves in dense mounds. The beautiful grass can grow to be over 15 inches tall and more than 12 inches wide. Sand or clay soil with adequate drainage and full sun exposure is ideal for this grass. In contrast, if you have a shaded yard or garden, you'll need a grass that does best with low light. River oats, which thrives in USDA zones 5-9, is a great choice. This grass produces bright white seed heads, which add a nice pop of color to your surrounding landscaping. This grass grows to be 2-3 feet tall and about 18 inches wide. It is adaptable and versatile and looks stunning when placed next to brightly colored flowers. The seeds can be dried and cultivated indoors over the winter. This native grass is identifiable for its blue-toned stems, which turn brilliant fall colors (red, orange, and yellow) in autumn. This grass also called “Little Bluestem” thrives in USDA zones 2-7. This grass has an extensive root system, which makes it much more drought-resistant than many other varieties. The grass needs ample sunlight – at least six hours daily – to thrive during the growing season. Because of its strong roots, this grass is often used as an anchor to hold and stabilize soil on vulnerable hillsides. 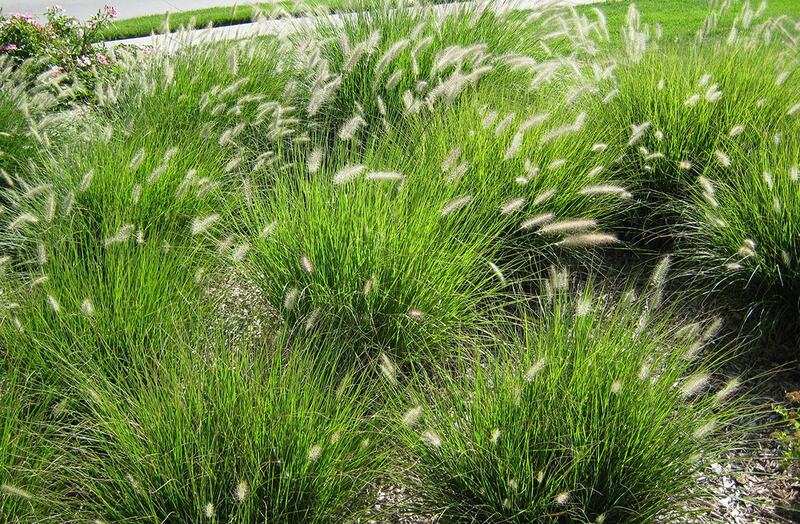 One of the most elegant and classic types of native grasses is Prairie dropseed. This grass features long, brightly-colored green stalks that grow to be up to two feet tall and two feet wide. Prairie dropseed lives in USDA zones 3-8. In late summer to early fall (August-September) the stalks produce beautiful flower spikes that have a nice golden-orange hue. This grass does best in soil with medium moisture content.